New casting has today been announced for the UK Tour of Hairspray as it continues to travel the length and breadth of the UK and Ireland. 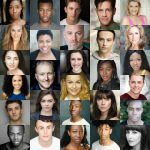 Having entertained big, bold and beautiful audiences across the country to critical and public acclaim since opening last summer, The new cast will perform in Stoke, Oxford, Newcastle, Eastbourne, Dublin, York, Swansea and Bournemouth. Joining the cast will be Raquel Jones (The Bodyguard, Jesus Christ Superstar) who will be returning to the role of Lil’ Inez having played the part for two years during the West End run of the production at Shaftsbury Theatre. Shak Gabbidon-Williams will be making his professional debut as Seaweed and Dan Partridge (Mama Mia!, Sleeping Beauty) takes over the role of Link Larkin. Established musical theatre performer Graham MacDuff will now play the role of Wilbur Turnblad alongside Gemma Lawson as Amber Von Tussle and Rosie O’Hare in the lead role of Tracy Turnblad. Brenda Edwards will continue in her critically acclaimed role of Motormouth Maybelle alongside Matt Rixon as Edna Turnblad. Jon Tsouras will retain the role of Corny Collins with Gina Murray (Chicago and Full Monty) as Velma Von Tussle, Annalise Liard-Bailey as Penny Pingleton.